I know the station's solar panels rotate to track the sun (and also rotate to be in-line with the station for lower drag on night passes), but how does the station itself rotate? I imagine it has to rotate for thermal management issues, or maybe not? I also believe it rotates for docking/supply ship approach, but I'm mostly interested in how it rotates for thermal management. Which axis? What's the rotation rate? Most of the time (when it's not maneuvering for experiments and/or visiting vehicles) the ISS maintains a "fixed" attitude in the noninertial Local Vertical, Local Horizontal reference frame. This means that it rotates about the Y body axis (the "port / starboard" axis) at a rate of one revolution per orbit, about 0.067 degrees per second. Not the answer you're looking for? Browse other questions tagged thermal-control attitude or ask your own question. 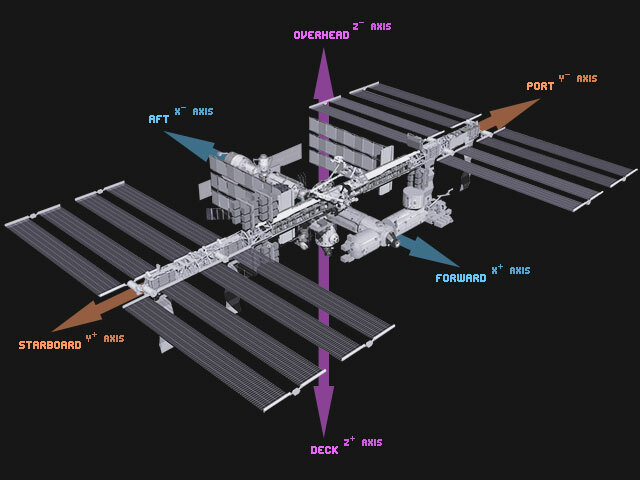 Why does the ISS rotate exactly once per orbit? How does “temperature” work in vacuum? Would Mayak's large solar reflector have produced a stable attitude, or more likely start tumbling or rotating? How does gravity-gradient stabilization work?